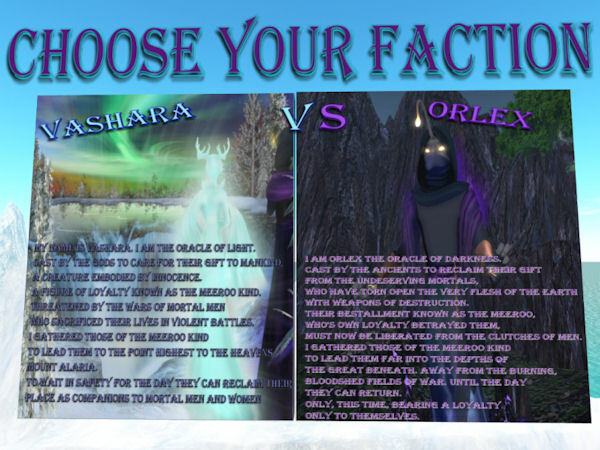 VASHARA OR ORLEX... who will you choose..
Meeroos CSRs and Moderators are hosting a contest! ***There are NC's in several languages as well as a NC with a bit more explanation on Roo sim, center, in the contest posters. Feel free to ask any questions you may have! Everyone is Invited to choose a Faction, Either Vashara and the Diurnal Meeroos or Orlex and the Nocturnal Meeroos. We want you to design a picture/ scene using 50 prims for the scene plus two meeroos, their food and a home. When you have it completed, take a snapshot, and send it (not photo shopped) to Jinxmeeroo resident. the picture must be received by January 23, 2015. The meeroos staff team will then make the first decision, and 5 scenes from each Faction will be chosen. The ten lucky semi-finalists will then have a week to rebuild their scene on Roo Sim. It must match the picture exactly. Voting will then be opened to the community to vote on which Orlex and Vashara scene they like the most! So it really is time to show your allegiance to an Oracle. Lets see how creative you can be! There will be prizes for everyone who submits a snapshot. An additional prize for the 10 semi-finalists and a prize for the two winners. ***There are NC's in several languages as well as a NC with a bit more explanation on Roo sim in the center. Feel free to ask any questions you may have!